Please click on a category below for more information! I'm Interested, what's My Next Step? Your Island Connection, LLC was founded in 1981, and we remain locally owned and operated. Heather Allen purchased the business in 2011 after working four years with the company founder. Since the purchase we have more than doubled the number of our reservations and continue to increase by at least 10% each year. We also have 50% of tenants that return year to year and another 10% who return every couple of years. In fact, rentals from 2017 increased 15% over 2016. Our knowledgeable crew of friendly, hardworking area natives, have over 50 years of combined service in the hospitality industry. We are proud of our fishing community and enjoy sharing its hidden treasures with our owners and renters alike. Building personal connections with owners and tenants is something we feel is an essential part of our business. We take great pride in providing excellent, and timely service to both our owners and renters. We are constantly continuing to educate ourselves about the industry. We attend local, regional, and national meetings/conferences which keeps us up to date on market trends, legislation, and new technology. Heather is the current President of the VRPOMe (Vacation Rental Professionals of Maine) which is an association of Professional Rental Managers from around the State that focus on current Legislative issues. This group has been successful in making sure regulations at the state level will not put the vacation rental industry out of business, this would have impacted both companies and individuals rent properties. "I have been very happy working with Your Island Connection. Not only were they helpful when I switched from another company to them, they have been able to find renters who have respected our property in much the same way we do. Coming back after the renters leave and finding our place clean, neat and well cared for is one the best services Your Island Connection provides." What makes a home a good YIC vacation rental? Location - Our rental area is Harpswell, Bailey Island, Orr’s Island, Great Island, and Cundy’s Harbor. Proximity to the water - Waterfront and/or Waterview properties are ideal rentals. However, we will consider properties that have nearby water access. Contents - We have a list of items that we require each home to have to ensure the guests have everything they need while at your home. For example, a lobster pot, enough utensils & dishes, and a grill are a few items on the list. Furniture & Beds - We strongly encourage that furniture and beds be in good shape, clean, and comfortable. Nothing worn out and unable to keep its shape. Safety 1st - It is state law that we require smoke detectors, carbon monoxide detectors, and a fire extinguisher. Handrails, no exposed wires, and other various safety hazards also need to be addressed. Insurance - You must provide proof that your property has proper insurance for functioning as a rental. Availability - We want to help you generate the highest income we can for your property. In order to do that we need the most availability you can give us, ideally that means letting us rent 6 out of 8 of the biggest peak weeks (July & August). Are you interested in listing your vacation home with us? The first step to renting your home is to click HERE and give us a little information about your home. If you prefer you can send the following information via email to [email protected] or send via mail to PO Box 300, Bailey Island, ME 04003. A short Description, please include how many bedrooms & bathrooms. Once we receive this information we will review it, and then contact you to let you know if we have determined that it would be a good fit for our inventory and guests. We try to be selective about the homes we consider, as this ensures rentability, so we can generate enough income to make it worth YOUR while to rent your property. 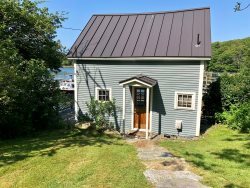 "We are so happy to have found Your Island Connection to manage our cottage on Bailey Island. We started working with them late in the season and they have done a great job finding trustworthy and responsible renters, keeping the place clean and fixed up, and letting us know what they needed from us (which was very little!). They allowed us out of staters to have some peace of mind and know our property would be well taken care of. Looking forward to many seasons ahead - thank you, Michaela and Heather!"